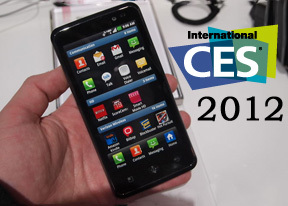 Our tour around the CES 2012 booth continued with Kodak and their Android-running smartphone Polaroid SC1630. The 16 megapixel device is one of the very few phones to offer optical zoom, which lets it easily stand out in the crowd. Back in the days, when this one was going by as Altek Leo it hardly turned into a great success, but now it has an even higher resolution camera - 16MP - and some of Kodak's image processing magic, so it should have better chances on the market. The Polaroid SC1630 really starts turning heads when its lens extend - they offer up to 3x optical zoom. Other camera specs that Kodak shared are F3.1-F5.6 aperture, ISO up to 3200 and shutter speeds of up to 1/1400. Along with the Polaroid SC1630, Kodak had a very compact printer at their booth that allowed the printing of images directly from the smartphone. Razer are best known for their PC gaming accessories, but recently they're making a push into gaming devices (like the Blade laptop), too. 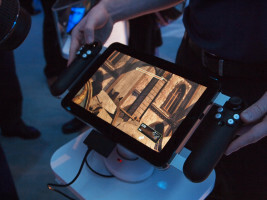 Project Fiona is a really interesting device - it's a 10.1" Windows 8 tablet with gaming controllers bolted to its sides. The controllers look quite similar to the the PlayStation Move (besides the glowing ball on top, of course). Each of the controllers has a joystick with four buttons on it and two shoulder buttons. The device includes force feedback, 3-axis gyro, magnetometer and an accelerometer. 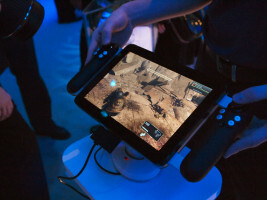 Between these controllers is a large 10.1-inch, 1280 x 800 resolution multi-touch display. Along with that you also get Wi-Fi 802.11b/g/n, Bluetooth 3.0 and Dolby 7.1 surround sound. Powering all of this is Intel’s Core i7 processor (an unknown Ivy Bridge model). Razer withheld info on the GPU. The tablet runs Windows 8 with custom Razer software that allows you to map controls, so regular PC games can run out of the box. Of course, devs can choose to support the additional goodies that come with Project Fiona - the accelerometers, the touchscreen and so on can add a whole new level to "desktop" games. Now, Fiona is rather chunky for a 10.1" tablet - by a rough estimate it weighs around 1.5kg. That's heavy to hold up for a long time, but if you prop it up on your lap you shouldn’t have a problem. Razer was mum on battery life. The device is still in developmental stage and the design and some of the specs may change by the time it arrives in Q4, 2012. No exact price has been revealed but Razer plans to keep it under a $1,000.